Does a slightly moral wrong of doping in cycling of all sports really matter if the right means a total of over $500 million raised in cancer research? This is the dilemma the USADA faced when CEO Travis Tygart decided going after Lance Armstrong over possible doping during his career was worth jeopardizing Lance's reputation and consequently the Livestrong Foundation and its fight against cancer. It's pretty clear that America didn't share Tygart's ambition in going after one of our greatest sports heroes, as the popular opinion is still firmly behind Team Lance. The yellow bracelets tell the story of Livestrong's impact, as does the fact that after the announcement was made that the USADA would strip Lance of his 7 Tour de France titles, the foundation received a huge spike in donations. Lance Armstrong is not Barry Bonds, an arrogant jerk who because of his steroid use took a hallowed record away from a living legend in Hank Aaron. Nor is he Rafael Palmeiro, who waved his finger at Congress, or Sammy Sosa, who suddenly couldn't remember how to speak English when faced with admitting to steroid use. No, Armstrong is a cancer survivor who came back from the brink of death to win 7-straight Tour de France's and inspire millions of cancer patients around the world to never give up and never stop fighting. So what if Armstrong may have used performance enhancing drugs? It's cycling for goodness sakes. Every one of those cyclists uses something to gain an edge. Armstrong cheating amongst cheaters in a sport without sacred records does not affect us as American sport watchers in any way. While it may not be the best thing that he won't be honest with admitting to using performance enhancers, what he did for cancer research trumps any transgression he committed during his cycling career. Ask yourself this question Travis Tygart: If Lance Armstrong doesn't cheat, does Livestrong ever become as big as it has? 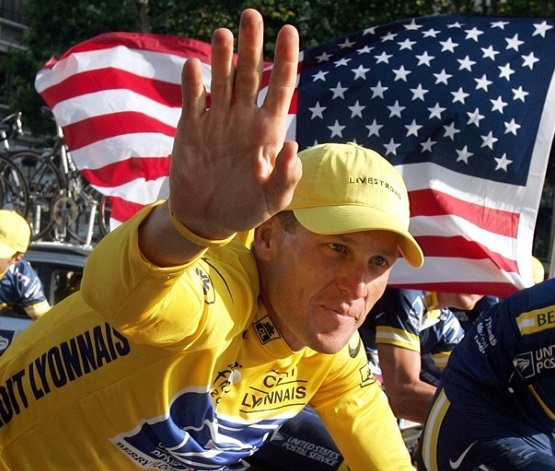 How many lives has Armstrong and his charity saved because of his success on the bicycle? Tygart and the USADA can try to take away Lance's accomplishments, but they can never take away from what he did off the bike in helping his fellow human beings fight a sometimes unbeatable foe. When you're fighting cancer, it's a win at all costs mentality; no performance enhancers are off limits. If Lance all hopped up on EPO inspired a cancer patient to not give up and succumb to the disease, then the USADA can go kick rocks. While Tygart may be entitled under law to go after Armstrong, he certainly could have weighed the risk of public backlash before trying to destroy a 40-year-old icon, whose image is so powerful and uplifting to so many people. Sometimes in life, you gotta know when to just say a wrong can make a right, and in this case, I believe a dirty Armstrong is just as important as a clean one. How many lives are going to be lost now if Lance gets exposed as a cheater? Do you want that weighing on your conscience USADA? I don't think so. Stay away from our Lance. Interesting take. Hadn't really looked at it that way. Armstrong could have still made a difference with his foundation had he been clean all those years. A wrong never makes a right in my book. I don't understand how they can even do this to him in the first place. He's never tested poitive for anything has he?